When crusaders conquered Constantinople in 1204, Byzantine emperor Theodore I fled to Nicaea, present-day Iznik. Having been once defeated, the walls he built around his new city certainly show a bit of wariness, if not outright paranoia. 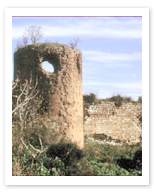 Nicaea’s outer ring of walls, imposing in itself, was further fortified by a moat and 100 watchtowers. Sadly for Theodore, it seems that walls alone do not a safe city make, and Iznik was successfully raided by a succession of invaders, including the Ottomans. As a tribute, you may as well go ahead and breach them yourself. There are plenty of places to climb and very few archers to shoot you off once you make it to the top of a wall or gate, where you should gain a pretty nice view of the surrounding city.